In 1863, Abraham Lincoln proclaimed Thanksgiving to be a national holiday in the United States, so I thought it might be fun to take a look at foods that he enjoyed. According to The History Kitchen, Abraham Lincoln's wife, Mary Todd Lincoln, taught herself to cook from “Miss Leslie’s Complete Cookery”– a cookbook Mrs. Lincoln had purchased as a newlywed. Written by Eliza Leslie and originally published in 1837, it was considered the most authoritative American cookbook of the time period. It was also the most popular. Mrs. Lincoln was known to rely heavily on Miss Leslie's recipes. So, is this the cranberry sauce that Lincoln had on his Thanksgiving table? 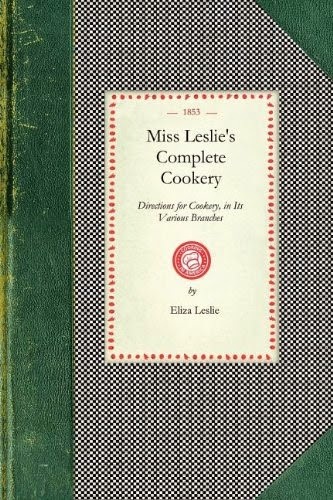 Since it's the cranberry sauce in Miss Leslie's cookbook, it's very likely that it was. Originally, Miss Leslie's recipe reads, "Wash a quart of ripe cranberries, and put them into a pan with about a wine-glass of water. Stew them slowly and stir them frequently, particularly after they begin to burst. They require a great deal of stewing, and should be like a marmalade when done. After you take them from the fire, stir in a pound of brown sugar. When they are thoroughly done, put them into a deep dish, and set them away to get cold." Wash and sort cranberries. Combine with water in a heavy sauce pan. Cover and cook over low to medium heat until berries pop and the mixture becomes jam-like. Be sure to lift cover and stir from time to time so the sauce does not stick and burn. Add brown sugar and stir until sugar melts into the jam. Remove from heat and refrigerate until ready to serve. I made this exactly as written by Ms. Ehmey, and it is delicious. I'm such a fan of adding oranges to my cranberry sauce that I had forgotten how lovely the unadorned cranberry flavor really is. This sauce has the perfect texture- it jells just enough, and still leaves plenty of the cranberries' shape intact. The brown sugar gives a nice layer of slightly richer flavor. This historic recipe may have been taken to some of these great parties! Yum! This looks so delicious. I'd love to try it out sometime. I'm not a fan of canned cranberry sauce, but I imagine this would be delicious. Oh, I just love how you shared a little bit of history with this so simple recipe. Thanks for sharing with The Good Neighbor Blog Hop. Pinning the recipe to use this Thanksgiving. thanks for sharing. Visiting you from the Good neighbor blog hop. Have a great week! Ann, I'm so glad you liked it- I hope you enjoy it as much as we do! It was fun and interesting to prepare a historic recipe. We're having for Thanksgiving dinner, too- quite a conversation piece! :) Thank you for coming by from the hop! Heather, I had never tried it with brown sugar, either, so I wasn't quite sure what to expect. Happily, it was very good! :) Thank you for coming by, and for pinning! It never occured to me to make my own - this sounds really good! I so want to try it this Thanksgiving! Thanks for linking up to Snickerdoodle Sunday! Thank you- we really liked it. :) Thanks very much for coming by and for hosting Snickerdoodle Sunday! Fun historic recipe! I will try it next year. I have to have a bite of cranberries with every bite of turkey. lol! Hope you had a wonderful day! Great post, Joy. I'm glad you shared the history behind this cranberry sauce. It's interesting that Mary Todd Lincoln taught herself to cook. I guess I just assumed every girl in those days would have been taught to cook at her mother's knee. Your photos are lovely. They're the perfect vignettes for the post. Don't you think cranberry is the perfect shade of red. So festive! G'day I loved reading this post today Joy and sharing the love today for you!